Have you always wanted to write a story but never got the motivation to? Campus Diaries which is India's largest storytelling platform for students might just give that impetus to. They are runnin a contest where you can win prizes worth over a lakh. They had interviewed me a few days back and asked me for writing tips. I maintain that I am still a learner when it comes to writing, even though I might have six best-selling novels behind me. I have a long long way to go and I am constantly reading up and looking for ways to improve my writing. However, whatever I know I was happy to share. I loved the way they had presented the interview. The reason I have been a little slow in updating my blog is--you guessed it---I am working on my next book. Love does not recognise age. A friend and I were talking about age. I have always felt that age is just what is inside your head and what you feel. In fact in one of my books, a character says this: You can be old at 22 or you can be young at 73. In our country it seems to be taken for granted that once you reach a certain age, you have to lead a subdued life. Finding love is out of the question. You have to be content with singing Bhajans and visiting temples. The 2007 movie Cheeni Kum highlights this beautifully, where Amitabh Bachchan plays a man in his 60's who is so unlike his peers and a 30 year old woman (played by Tabu) falls in love with him. 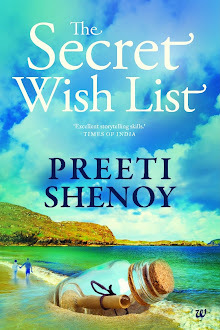 A review I read this morning about my book 'The Secret Wishlist' amused me. Because while the reviewer loved my writing style---he said it was so gripping that he just couldn't stop reading it---he had a problem with the extra-marital affair. He said he had read the book at the same time as Deepika Padukone's video came out and he felt that the book glorified adultery. 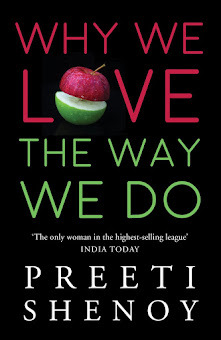 Many people,both men and women,who aren't able to put the book down are not able to accept the fact that a woman can find love outside her marriage. It is not entirely impossible you know! I came across a brilliantly expressed piece written by a marriage counsellor who sees hundreds of couples in relationship crisis. The piece is titled 'Why women leave the men they love--What every man needs to know'. One of the best things that I have done in my life (other than writing 6 books so far ;-)) is enrolling for Ashtanga Yoga. I have always been practicing Yoga ever since I was introduced to it, which was when I was about 11 years old. We had Yoga in school as a part of our curriculum and my yoga teacher always selected me for the Yoga demos which he would give at various places,mostly inside IIT campus Chennai, which was where I went to school. I continued my yoga practice long after I left school and I would do it on my own, as I knew all the asanas. I developed my own routine. When I moved to the UK too, I continued my practice. Of course, at times there would be months and months when I wouldn't do Yoga at all, but much like old lovers whose lives are inextricably entwined, I couldn't stay away for too long. I would always go back to my practice.